The Cottage is an end-terraced stone cottage in the North Yorkshire village of Ampleforth. The cottage sleeps six people in three bedrooms - two doubles and one room with bunks beds. There is a bathroom with bath, shower over, basin and WC. The living accommodation is made up of a kitchen, dining room with French doors, a sitting room with woodburning stove and a small conservatory overlooking the garden. The garden is made up of tiered patio levels with furniture and a BBQ. Off road parking is available for one car. With the lovely countryside of the national park close by, and the east coast resorts within driving distance, The Cottage makes a good family base from which to explore both coast and country. Amenities: Gas central heating with woodburning stove. Range cooker with electric oven and 6 ring gas hob, microwave, fridge, freezer, washing machine, TV with Freeview, DVD, radio, WiFi. Fuel, power and starter pack for woodburning stove inc. in rent. Bed linen and towels inc. in rent. Travel cot on request. Off road parking for 1 small car, additional roadside parking outside property. Steps leading down to rear tiered patio gardens with furniture and BBQ. One well-behaved dog welcome. Sorry, no smoking. Shop and pub 3 mins walk. Note: Please note that this property is not suitable for 6 adults due to sleeping arrangements. Town: Ampleforth is close to the North York Moors National Park, and is home to two pubs, a fish and chip shop and shop. 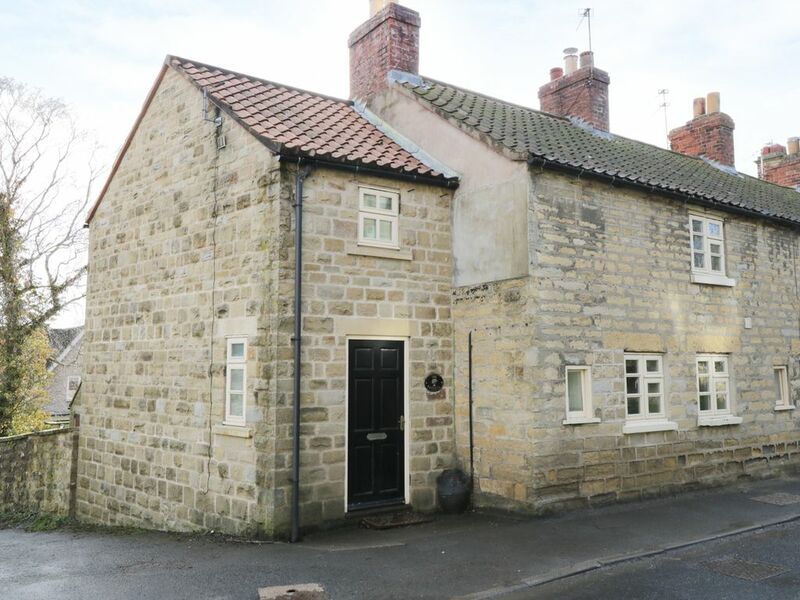 Helmsley market town is 5 miles away and the National Park is close by offering great scenic walking and cycling. Within easy driving distance are Pickering and the East Coast resorts such as Scarborough. Three bedrooms: 2 x double, 1 x children's bunks. Bathroom with bath, shower over, basin and WC. Small modern kitchen. Dining room with French doors to garden. Sitting room with woodburning stove. Small conservatory leading off sitting room. Property sleeps 6 people as a combination of children and adults due to bunk beds. Gas central heating with woodburning stove. Range cooker with electric oven and 6 ring gas hob, microwave, fridge, freezer, washing machine, TV with Freeview, DVD, radio, WiFi. Fuel, power and starter pack for woodburning stove inc. in rent. Bed linen and towels inc. in rent. Travel cot on request. Off road parking for 1 small car, additional roadside parking outside property. Steps leading down to rear tiered patio gardens with furniture and BBQ. One well-behaved dog welcome. Sorry, no smoking. Shop and pub 3 mins walk. Note: Please note that this property is not suitable for 6 adults due to sleeping arrangements.